Last week Montreal’s most savvy social tastemakers gathered together for a special media preview of Atame, a restaurant hoping to excite our senses in the most titillating of ways. Located in the heart of the Plateau and mere steps from St. Denis, Atame (Spanish for tie me up) aims to provide their guests with an intimate, airy atmosphere in which we let ourselves get carried away by the sights, sounds, the slightest touch and tastes that awaken our deepest desires. Their menu consists of tapas style servings of stimulating aphrodisiacs such oysters, scallops (with kefir lime, saffron and coconut milk), slow roasted fillet minion, duck breast served with fresh figs and more. They want you to get comfortably close and share your food. The menu is served until midnight from Tuesday to Saturday leaving you lots of time to enjoy every little taste. The cocktail menu is dripping with cleverly blended, aphrodisiac-based ingredients such as Maca, Muria Puama, Damiana, Tribulus terrestris and Tongkat Ali; no I had never heard of any of these things before that night but I’m game for anything that is blended into a perfectly mixed Old Fashioned. While the drinks and the wine I tasted were delicious the bar area felt bare and unfinished which I hope will change as they grow. The atmosphere of the restaurant works in a way that feels light and delicate. 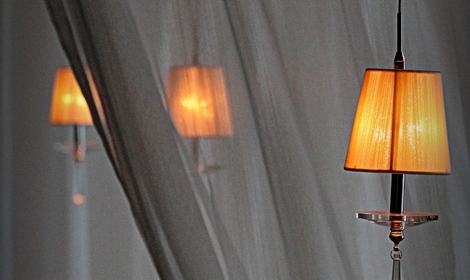 Sheer curtains divide the almost entirely white and beige space in a way could have come off as tacky (think Bonnie Tyler video), but instead they hit the mark with the right balance of intimate corners and open, perfectly lit space (think romantic; a light breeze softly billowing curtains in a large room with shadows dancing in flickering candlelight – much better). Atame also hopes to seduce their guests with weekly performances meant to arouse the eyes. At the media event we were serenaded by a performance from Christine Ghawi, shushed into silence by sultry Chloe Bourgeois and stirred from our seats with a burlesque performance by Lou Lou la Duchesse de Riere. To enjoy the weekly performances it might best to have a table in the middle of the restaurant and not on the periphery. Any restaurant hoping to be successful must keep customers coming back while always attracting a new clientele. First time customers will be curious and the food and drinks are well prepared which will keep people coming back. Though the knowledgeable staff served us promptly and professionally, I can’t help but wonder how the service is on a normal night. With bigger events such as the one we all attended, it’s difficult to gage how the wait staff and bar staff treat their tables. Overall, because of the great company I shared, I had a great first night at Atame and I would be easily tempted to pay another visit to experience the intimacy first hand. All photography courtesy of Sébastien Laloy.